Introducing the new PayLah! app experience. 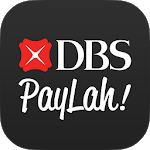 Scan & Pay via QR Code at thousands of stores, pay friends, split bills, and more with DBS PayLah! - Singapore’s favourite mobile wallet. This is the way we PayLah! 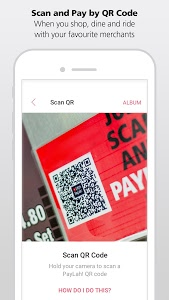 • Scan and Pay with QR Code: Available at thousands of NETS QR Code, PayLah! QR Code enabled merchants such as Comfort / CityCab Taxis, Popular, Texas Chicken and more! • PayNow integration: Transfer funds to PayNow registered users, even non-DBS customers, who have not signed up for PayLah! 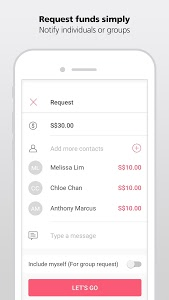 • Send Money / Request Money: Send money or receive payments from anyone, even non-DBS / POSB customers via mobile numbers, QR Codes and Payment Links. You can also transfer funds to PayNow registered users who have not signed up for PayLah! • My QR: Create a QR Code or a payment link to request and collect payments for items or services that you’re promoting online through marketplaces like Carousell without disclosing your mobile phone number! • eAng Bao: Celebrating with your friends/family? Send an eAng Bao to them! All with PayLah! No other eWallet, mobile payment, online banking, or finance application in Singapore allows you to do so within the same app! 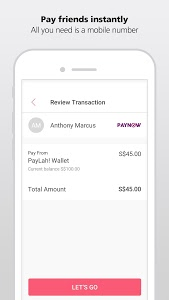 • Auto Debit: Enable this feature for seamless payments with PayLah!. Skip the ‘Top-up’ step as the funds will be deducted directly from your linked bank account when you have insufficient wallet balance. • Top Up via FAST: Non DBS / POSB internet banking / digibank users can top up their PayLah! wallets from other banks via online FAST transfer service. • Notify Your Friends: Receive or send notifications online when you send money / request for payments! Available via SMS, WhatsApp, Facebook messenger. Download and register for Singapore’s favourite mobile wallet now! • QR Ang Bao: Try a new way of gifting this Chinese New Year! Simply scan QR, load and gift. Get these limited edition QR Ang Baos at DBS/POSB branches or pop-up ATMs from 25 January 2019 onwards. • Implemented bug and stability fixes for a seamless payment experience. Similar to "DBS PayLah! - Supports PayNow"